From the Hancock County Courthouse, go southeast on Hwy 15 for 5.2 miles. 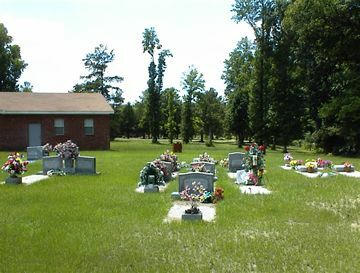 The cemetery is about 125 feet from the left side of the highway and behind the church. Graves numbered 40 or higher have been added since the original survey and are believed to be somewhere in the cemetery. "Wife and Mother" "In all thy ways acknowledge Him". On headstone adjoining James Adolph Smith's. "Daughter and Mother" On same headstone as Gertrude B. Coble. "Mother and Grandmother" On same headstone as Gloria E. Grant. On same headstone as Willie Mae Boone. On same headstone as Charlie M. Boone. Age 42. All info per funeral home marker. Age 92. All info from obituary. Age 36. All info from obituary.